Background: Knee osteoarthritis is an increasing health concern in the adult population. Nonsurgical treatment options for pain reduction and function improvement are limited in number and provide only short-term relief. The potential of regenerative therapies to go beyond temporary symptom reduction and delay or negate the need for total knee joint arthroplasty is enticing to both patients and providers. Purpose: This study evaluated the clinical efficacy of autologous intra-articular bone marrow concentrate with autologous lipoaspirate as a treatment option for osteoarthritis of the knee. Additionally, bone marrow concentrate samples from a patient population subset not necessarily enrolled in this study, but IRB approved, were sent for outside laboratory analysis. Study design: This study is a prospective case series. Methods: Treatment registry data for 70 patients diagnosed with Kellgren-Lawrence Stage 2–4 knee osteoarthritis were analyzed. Data regarding adverse events and Knee injury and Osteoarthritis Outcome Score metrics were obtained at baseline, 90 days, and 180 days. Samples of bone marrow concentrate from 11 patients were sent to an outside source for laboratory analysis. Results: Adverse events were limited to transient pain and swelling of the treated joint. The mean reported KOOS changes from pre- procedure to 180 days post-procedure were as follows: Pain + 18.1, Activities of Daily Living +15.6, Symptoms +17.3, Quality of Life +20.3, and Sports/Recreation +18.1. Laboratory analysis of the samples demonstrated statistically significant increases in concentration of platelets, interleukin-1 receptor antagonist and IL-1β. The IL-1ra/IL-1β ratio was also statistically significant at 193.54 when processed with a 2% Hct setting, and 720.62 when processed with a 15% Hct. Conclusions: This study of intra-articular injection of autologous bone marrow concentrate and lipoaspirate in patients diagnosed with knee osteoarthritis demonstrates encouraging results for positive outcomes without complication. Further study with randomized controlled trials is warranted to prove the potential of this intervention. With laboratory analysis of samples of bone marrow concentrate we were able to identify the presence of statistically significant increases in the concentration of platelets and IL-ra. What this study adds to the existing knowledge: This study supports the findings of the two published clinical studies of bone marrow concentrate on patients with knee osteoarthritis. This alternative treatment option provides positive patients outcomes with low risk. An animal study performed by Saw et al showed complete coverage of full thickness chondral defects 24 weeks after sub-chondral drilling and concomitant application of BMC and HA in a goat model.46 Fortier et al applied BMC after microfracture on an equine model with full thickness chondral loss, showing successful regeneration of hyaline cartilage via MRI and histological evaluation.22 These pre-clinical trials have led to a few small clinical studies. A 2012 review by Filardo found 2 pre-clinical papers and 5 clinical trials focusing on the use of BMC in cartilage regeneration.21 Since Filardo’s publication, two retrospective case reviews have been published showing the efficacy of BMC in patients with knee OA.12,32 Although these studies have small numbers, they offer a good start at unraveling the clinical potential of BMC. To date no randomized controlled trials of BMC in patients with knee OA have been published, although many are registered as ongoing at clinicalgov.com. In the osteoarthritic knee there exists an imbalance of the chondrocyte’s catabolic and anabolic functions. This inequality leads to degradation of the extracellular matrix of hyaline cartilage and is mediated by pro-inflammatory cytokines.14,23,31 The chronic inflammatory process that ensues causes further cartilage damage, and eventually leads to mechanical and biological dysfunction within the joint.3 The cytokine interleukin-1 (IL-1) appears to be of particular importance in this destructive inflammatory cycle.52,53 One of the known antagonists to this cytokine is IL-1 receptor antagonist protein (IL-1ra). Although not FDA approved in the United States, Autologous Conditioned Serum (ACS) has gained significant media attention due to some famous athletes having well publicized success stories. It is believed that ACS’s success is linked to IL-1ra. Studies in animal models have shown that introducing IL-1ra intra-articularly will slow the progression of cartilage lesions.10,42 Chevalier et al in a 2005 multicenter human study showed a single intra-articular injection of IL-1ra (up to 150 mg) was well tolerated and did not cause any acute inflammatory reaction.14 Baltzer et al found that intra-articular hip injection of ACS in patients suffering from hip osteoarthritis led to statistically significant reductions in pain.3 A prospective randomized controlled double blind trial did provide evidence that IL-1ra is more effective than placebo and/or HA for the treatment of knee OA.2,56 Although there does not seem to be a consensus on the minimum level of IL-1ra necessary to achieve therapeutic benefit, it has been generally reported in the literature that a ratio of IL-ra to IL1β on the order of 10-1000 to 1 is sufficient to effect blockade of the IL-1 receptors or the IL-1 triggered effects, thereby alleviating the degenerative effects of IL-1. At present, it is not clear that a complete blockade of all biologically active IL-1 receptors is necessary to significantly impact such pathologic conditions such as osteoarthritis55 Currently there exist only two commercially available ACS products for human use. Both have methodology that violates the point of care rules set forth by the FDA, and thus are not available in the United States. The aim of this prospective case series was to further the currently available data on BMC as a safe and efficacious treatment option for knee OA in a human model. A secondary goal was to perform in-depth analysis of samples of the BMC produced by the Arthrex Angel in a subset of patients to determine its cellular and cytokine composition. This study is a prospective case series performed at a single center outpatient clinic using data from 3 physicians. All patients undergoing the procedure had their bone marrow aspiration, lipoaspiration, and end-product placement performed by the same physician. All three physicians followed specific internal clinical protocols. Included in this study were all patients undergoing a BMC procedure for knee OA between April 2014 and October 2014 who consented to the IRB approved survey. Patients were identified at an initial screening visit as having Grade 2–4 OA of the knee employing the KL scale.32 Those individuals interested in undergoing the BMC and lipoaspirate procedure were invited to participate in the clinic’s prospective data registry. The registry employed is the Surgical Outcomes System (SOS), an IRB approved subscription data collection system (Arthrex, Inc., Naples, FL). The approved metrics for non-operative intervention for knee OA in the SOS include KOOS measures.43 If a patient planned on having both knees treated with BMC they were to answer the surveys as it pertained to their most painful joint, to avoid having the patient fill out two separate surveys. Patients received surveys via email pre-treatment and at days 14, 42, 90, 180, 360 and 720 post-treatment. Any patient without email access completed their survey via phone as administered by two volunteers. All patients confirmed the cessation of NSAID’s at least 5 days prior to the procedure. Bone marrow was harvested using a multiport bone marrow aspiration needle from the posterior superior iliac crest. The total amount of bone marrow harvested was 60 cc for one knee and 100 cc if two knees were being treated. Using the manufacturer’s processing protocol BMC was created utilizing the Arthrex Angel centrifugation system. (Arthrex, Inc.) The final volume of BMC employed varied from 5-7 cc per affected knee. Acquisition of autologous lipoaspirate follows a simple standard sterile protocol to provide approximately 20 cc of product. (Tulip Medical, San Diego, CA) Selection of donor site for adipose graft harvest was usually from the flank on the same side of the bone marrow aspirate to easily maintain the sterile field. After harvest, low RPM centrifugation for three minutes was performed merely to permit separation of the unwanted infranatant fluid from the lipoaspirate. Sterile transfers (luer-to-luer) were used. No mechanical or enzymatic manipulation of the harvested adipose occurred. Prior to injection of the final products each site was surgically prepped, isolated, and ethyl chloride was applied for topical anesthesia. A dilute solution of .00125% lidocaine provided local soft tissue anesthesia. Using ultrasound guidance, 3 cc of the prepared BMC and 2 cc of the lipoaspirate was precisely introduced into the affected joint. Sterile field was maintained and 1 cc of prepared BMC and 1 cc of the lipoaspirate were placed along medial joint capsule under ultrasound guidance. Sterile dressings were applied and the knee was kinesiotaped for support for three days. Any patient with KL stage 3 or 4 OA of one dominant compartment were prescribed a Don-Joy or Bledsoe off-loader brace for the affected side, and were asked to wear the brace for a minimum of four hours a day while weight bearing for eight weeks post-procedure. The purpose of this brace by the authors was to support the capsule during the first few months of tissue regeneration. Patients were instructed to gently ambulate as tolerated for the first three to seven days post treatment to provide mechanical stimuli that are considered important for proper cartilage growth.15 Patients were started on a home exercise program one week after treatment, consisting of eccentric stretching, and were allowed to return to light activity as tolerated. Formal physical therapy was offered at four weeks but not required. Within six weeks patients were allowed to return to full activities, although long distance running and other plyometric activities were discouraged in those patient with KL stage 3 or 4 OA. Patients were instructed to avoid oral NSAID’s for four to six weeks post procedure. Data analysis based on our SOS finding occurred at the following time points: pre-treatment, 90 days, 180 days and one year. At the time this article was written only 11 patients were out one year from treatment providing too small an N to prove statistically significant findings. A total of 70 patients had reached 180 days post procedure. Thus, the data analyzed was limited to baseline, 90 days and 180 days. Patient age ranged from 28 to 83 years old, with an average age of 60. 49 were female and 21 were male. The lead author performed the procedure on 49 of the 70 patients. Of the remaining 21 patients, 14 underwent injection by the second author and 7 by the third author. 18 patients had a single knee treated and 52 had both knees treated. Radiographs were taken pre-procedure on 100% of the study participants. 32 (46%) of the patients were KL stage 4, 29 (41%) were KL stage 3, and 9 (13%) were KL stage 2. Table 1. 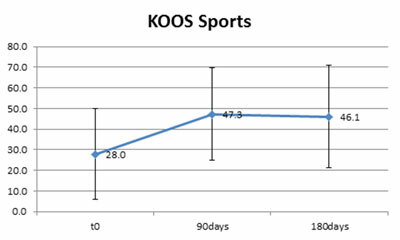 The blue line indicates the mean reported KOOS score for Function in Sports and Recreation at time 0, 90 days and 180 days. The standard deviation at each data point is represented by the vertical black lines. Table 2. 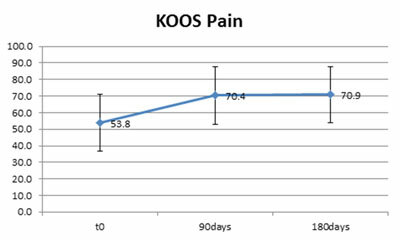 The blue line indicates the mean reported KOOS score for Pain at time 0, 90 days and 180 days. The standard deviation at each data point is represented by the vertical black lines. Table 3. 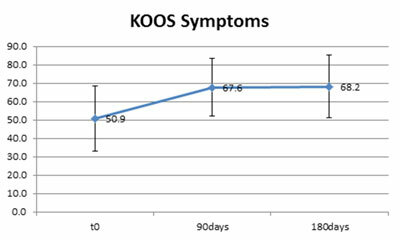 The blue line indicates the mean reported KOOS score for Symptoms at time 0, 90 days and 180 days. The standard deviation at each data point is represented by the vertical black lines. Table 4. The blue line indicates the mean reported KOOS score for Function In Activities of Daily Living at time 0, 90 days and 180 days. The standard deviation at each data point is represented by the vertical black lines. Table 5. 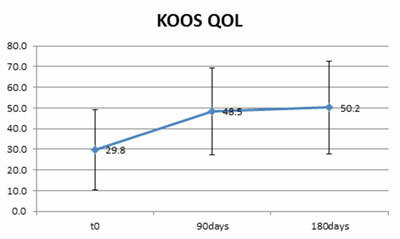 The blue line indicates the mean reported KOOS score for Knee Related Quality of Life at time 0, 90 days and 180 days. The standard deviation at each data point is represented by the vertical black lines. Table 6. KOOS increases between pre-treatment and 180 days post-treatment based on Kellgren-Lawrence Staging of knee osteoarthritis. Adverse events included post-injection pain and swelling. Of the 70 patients enrolled in the study 57 (80.3%) patients reported transient (< 7 days) increase in pain and 41 (57.8%) patients reported short-term (< 7 days) swelling. Previous studies of BMC and BMC with lipoaspirate injections for knee OA found similar transient pain and swelling post-treatment.33,12 No serious adverse events such as neoplasm or thrombosis were reported and no minor adverse events such as skin reactions or allergic responses. As a pilot project during the 180 day study period we sent 11 patient’s BMA and BMC samples to an outside laboratory for cellular analysis. Our goal was to determine cellular and cytokine concentrations of BMA vs BMC using the Arthrex Angel. Of these 11 samples sent, five were after concentration using the Angel’s 2% hematocrit (Hct) setting and six employed the 15% Hct setting. A 0.5 to 1cc aliquot of the patient’s BMA and BMC was analyzed for cellular and cytokine concentrations. (Sysmex XE-5000, Lincolnshire, IL) The samples were then frozen (-81˚C,). Once the samples were thawed they were tested for IL-1ra and 1L-1β ELISA. (R&D Systems, Minneapolis, MN) For statistical analysis, a t-test (α=0.05) was performed for each cytokine and cellular component. The results are shown in Tables 7-9. The BMC and PPP had statistically significant differences in concentration of platelets, IL-1ra and IL-1β. The IL-1ra/IL-1β ratio was also statistically significant: 193.54 at a 2% Hct setting and 720.62 at a 15% Hct setting. Table 7. Cell counts (thousands per microliter) of bone marrow concentrate produced by the Angel system at the 2% and 15% HCT setting. RBC reported in millions of cells per microliter. Table 8. Amounts (reported in picograms per milliliter) of IL- 1ra and IL-1beta in bone marrow concentrate produced by the Angel system at the 2% and 15% hematocrit setting. Table 9. Ratio of IL-1ra to IL-1beta in bone marrow concentrate produced by the Angel system at the 2% and 15% hematocrit setting. 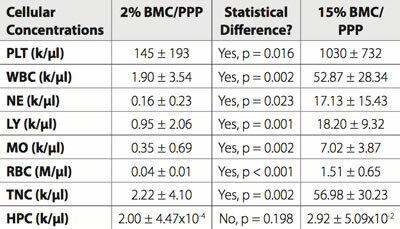 No study to date has compared short or long-term success of intra-articular PRP to BMC in the knee OA patient. BMC does have a proven advantage over PRP in that it has a greater concentration of MSCs.44 MSCs have demonstrated benefit in facilitating regeneration of cartilage and are easily harvested from bone marrow.22 BMC has multiple beneficial contents for regeneration of tissue, including hematopoietic stem cells, platelets (growth factors), cytokines and chemokines. BMC also has anti-inflammatory, chondrogenic, and immuno-modulatory properties.44 Iliac crest derived BMC has been reported to contain the highest numbers of MSCs at 72 x 106 TNC’s.27 Also, the complication rate associated with iliac crest bone marrow aspiration is extremely low.28 Thus, this study’s use of the posterior superior iliac crest as a location to aspirate bone marrow for concentration has been shown to be both safe and effective in producing acceptable numbers of MSCs. Our laboratory analysis of samples of BMA and BMC demonstrated statistically significant increases in platelets, IL-1ra, IL-1β and IL-1ra/IL-1β ratio. The fact that our patients experienced improvement in pain at 90 days raises this question: is this early change due to the presence of concentrated platelets and their positive effect on the synovium and synovial fluid, or conversely to the high levels of IL-1ra and it’s anti-inflammatory properties? Although there is no consensus on the minimum level of IL-1ra necessary to achieve therapeutic benefit, it has been generally reported in the literature that a ratio of IL-ra/IL-1β on the order of 10-1000:1 is sufficient to effect blockade of the IL-1 receptors, thereby alleviating the degenerative effects of IL-1.55 The levels of IL-1ra/IL-1β found in the BMC samples produced by the Arthrex Angel System were all within that range of 10-1000:1. The addition of autologous adipose tissue to the treatment regimen was primarily for it’s inherent scaffolding properties. Adipose is known to be inherently rich in MSCs and possesses an ability to recruit stem cells to the area of injection.16 The concentration of MSCs in adipose is 600 cells per cc and in bone marrow aspirate is 500 cells per cc49 which are substantially less than the reported 72 x 106 MSCs per cc in BMC.27 A study comparing the efficacy of BMC in knee OA patients with and without adipose showed no benefit in the intra-articular addition of the adipose graft.12 However, the aforementioned study did not place the adipose with the BMC in soft tissue areas where its scaffolding properties could potentially be more beneficial. It is the author’s belief that the inherent scaffolding properties of fat are most beneficial in soft tissue application. The use of amide-type local anesthetics with MSCs for injection has shown that these agents induce MSC apoptosis in a time- and dose-dependent manner that may threaten clinical outcomes.19 In this study we obtained the bone marrow and adipose tissue and performed the knee injections without general anesthesia. Thus, the use of a local anesthetic was necessary for patient comfort and tolerance. We chose a .00125% dilution of lidocaine for local anesthesia based on recently presented unpublished data showing maintenance of MSC adherence and cell viability. (Centeno, TOBI Conference 2013) We did offer oral analgesics and anxiolysis to all patients, as this has been proven to be affective in pain control during bone marrow aspiration.50 Guidance for final graft placement is highly recommended. All injections performed in this publication were done under ultrasound guidance. Like all biologics, BMC must have appropriate placement in order to be effective. Conventional palpation or anatomical landmark-based injection techniques are not sufficient to ensure proper BMC placement.7,47 The best injection strategy to treat knee OA has not yet been determined. Should treatment be only intra-articular, or should all regional pathology including soft tissues be injected as well? In this study, as with all of our patients with knee OA, we feel that the soft tissue, capsule and synovium play an important role in pain generation. Thus we target all abnormal structures versus simply the joint itself. In this study we did not have any severe adverse events. Transient pain and swelling occurred in many patients and it is the author’s practice to prepare the patient for the possibility of this transient adverse event following intra-articular BMC injection.44 None of our 70 patients experienced increased pain or swelling of greater than 10 days duration. Unlike a previous study of BMC and knee OA, none of the patients reported bleeding, hematoma, neoplasm, or rash.12 The safety of BMC treatment for knee OA is far greater than total knee arthroplasty. A 2014 study that followed more than 15,000 arthroplasty patients prospectively reported a serious adverse event rate of 5.6% with a 0.2% mortality rate.5 Although relatively low for such an invasive procedure this rate of serious adverse events does lend for the study of less invasive alternatives to total knee arthroplasty. A limitation of this study was the use of 180 day clinical outcome data. What is encouraging is that 11 of the 11 patients (100% survey compliance) that were at 360 days post injection had KOOS measures that remained steady from the 180 days point. 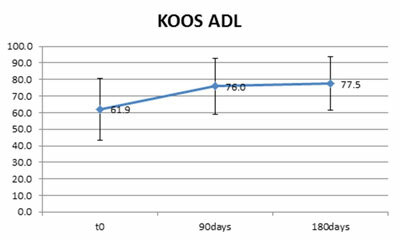 The KOOS changes from pre-treatment to 360 days in this group are as follows: Sport/Rec +16.1, Pain +18.2, Symptoms +17.4, ADL’s +16.8, and QOL +21.7. Although we will have stronger data in the near future our current findings are indeed promising. The need to perform long term follow up on these patients is vital, and the authors have plans to continue to gather survey data for a minimum of five years. An obvious limitation of the study is the lack of randomization and the absence of a control arm. Another limitation is the fact that there were three separate providers performing the injections. Although the authors follow strict protocols the potential for intra-user variability exists. Additionally, this study does not provide evidence of what is occurring anatomically and histologically in these knee OA patients. Ideally pre-treatment and one year post injection MRIs would be performed to evaluate for cartilage growth. The authors do routinely perform one year x-rays on patients treated with BMC for knee OA, as anecdotally we find that it takes a minimum of one year to see changes on x-ray. In this study the majority of patients were only out 180 days, thus radiographic evidence was not included in this case series. An additional flaw in this study was the inclusion of patients with KL Stage 2 to KL Stage 4 disease. Disease process variability is not an ideal situation when interpreting results. One other flaw of this study is that a laboratory analysis was not done on all patient’s samples, thus it is unknown if the platelet concentration and cellular content have an effect on outcome. The short-term follow up after injection of autologous BMC and adipose in patients with knee OA showed excellent results including decreased pain, increased function, improved activities of daily living and improved quality of life. With regards to the cellular and cytokine content of BMC it remains unclear which makeup leads to the best outcome in knee OA, warranting further clinical research. The complication rate for this treatment option is vastly less than that reported with knee arthroplasty. Although this study’s findings further the mounting evidence that BMC is an excellent treatment option for knee osteoarthritis, it is essential that further studies be performed including randomized controlled trials with pre- and post-treatment MRI. 1 Anz A, Hackel J, Nilssen E, Andrews J. Application of Biologics in the Treatment of the Rotator Cuff, Meniscus, Cartilage, and Osteoarthritis. J Am Acad Orthop. 2014;22(2):68-79. 2 Baltzer AW, Moser C, Jansen SA, Krauspe R. Autologous conditioned serum (Orthokine) is an effective treatment for knee osteoarthritis. Osteoarthritis Cartilage. 2009;17(2):152-60. 3 Baltzer AW, Ostapczuk MS, Stosch D, Seidel F, Granrath M. A new treatment for hip osteoarthritis: clinical evidence for the efficacy of autologous conditioned serum. Orthop Rev (Pavia). 2013;5(2):59-64. 4 Barone SB. “361” Human cells, tissues, and cellular and tissue-based products (HCT/Ps). The Office of Cellular, Tissue, and Gene Therapies Web Seminar Series. Available http://www.fda.gov/downloads/BiologicsBloodVaccines/NewsEvents/UCM251330.ppt. Accessed April 30, 2015. 5 Belmont P, Goodman, G, Waterman B, Bader J, Schoenfeld A. Thirty-day postoperative complications and mortality following total knee arthroplasty: incidence and risk factors among a national sample of 15,321 patients. Journal of Bone and Joint Surgery. 2014;96(1):20–26. 6 Benke M1, Shaffer B. Viscosupplementation treatment of arthritis pain. Curr Pain Headache. 2009;13(6):440-6. 7 Berkoff, D, Miller L, Block J. Clinical utility of ultrasound guidance for intra-articular knee injections: A review. Clin Interv Aging. 2012;7:89-95. 8 Caplan A, Dennis J. Mesenchymal stem cells as trophic mediators. J Cell Biochem. 2006;98(5):1076–1084. 9 Caplan AI, Correa D. PDGF in bone formation and regeneration: New insights into a novel mechanism involving MSCs. J Orthop Res. 2011;29:1795-1803. 10 Caron JP, Fernandes JC, Martel-Pelletier J, et al. Chondroprotective effect of intra-articular injections of interleukin -I receptor antagonist in experimental osteoarthritis. Suppression of collagenase-J expression. Arthritis Rheum. 1996;39:1535-44. 11 Casteilla L, Planat-Benard V, Laharrague P, Cousin B. Adipose-derived stromal cells: Their identity and uses in clinical trials, an update. World J Stem Cells. 2011;3(4):25-33. doi: 10.4252/wjsc.v3.i4.25. 12 Centeno C, Pitts J, Al-Sayegh H, Freeman M. Efficacy of autologous bone marrow concentrate for knee osteoarthritis with and without adipose graft. Biomed Research International. 2014;14:1-9. doi 10,1115/2014/370621. 13 Cerza F, Carnì S, Carcangiu A, Di Vavo I, et al. Comparison between hyaluronic acid and platelet-rich plasma, intra-articular infiltration in the treatment of gonarthrosis. Am J Sports Med. 2012;40(12):2822-7. 14 Chevalier X, Giraudeau B, Conrozier T, Marliere J, Kiefer P, Goupille P. Safety study of intraarticular injection of interleukin 1 receptor antagonist in patients with painful knee osteoarthritis: a multicenter study. J. Rheumatol. 2005;32(7):1317-1323. 15 Cole BJ, Fortier L, Cook JL, Tilton AK, Chapman HS, Roller B. Use of Micronized Allograft Articular Cartilage and Platelet Rich Plasma to Augment Marrow Stimulation in an Equine Model. Podium, 12th Annual ICRS World Congress, Chicago, IL, May 8-11, 2015. 16 Coleman SR. Structural fat grafting: more than a permanent filler. Plast Reconstr Surg. 2006;118(3):108S–120S. 17 Crane D, Everts P. Platelet Rich Plasma (PRP) Matrix Grafts. Practical Pain Management. 2008;8:12-27. 18 Degen RM, Bernard JA, Bare CM, Tucker MS, Oliver KS, Dines JS. Differences in Cellular Composition of Platelet Rich Plasma Produced from Commercial Separation Systems. Submitted for publication May 23rd, 2015 Am J Sports Med. 19 Dregalla R, Lyons NF, Reischling PD, Centeno CJ. Amide-type local anesthetics and human mesenchymal stem cells: clinical implications for stem cell therapy. Stem Cells Transl Med. 2014;3(3):365-74. 20 Filardo G, Madry H, Jelic M, Roffi A, Cuccchiarini M, Kon E. Mesenchymal stem cells for the treatment of cartilage lesions: from preclinical findings to clinical applications in orthopaedics. Knee Surg Sports Traumatol Arthrosc. 2013;21:1717-1929. 21 Filardo G, Kon E, Di Martino A, et al. Platelet-rich plasma vs hyaluronic acid to treat knee degenerative pathology: Study design and preliminary results of a randomized controlled trial. BMC Musculoskelet Disord. 2012;13:220-229. 22 Fortier L, Potter H, Rickey E, et al. Concentrated Bone Marrow Aspirate Improves Full-Thickness Cartilage Repair Compared with Microfracture in the Equine Model. J Bone Joint Surg Am. 2010;92(10):1927-1937. 23 Frisbie D, Ghivizzani S, Robbins P, Evans C, Mcilwraith C. Treatment of experimental equine osteoarthritis by in vivo delivery of the equine interleukin-I receptor antagonist gene. Gene Tiler. 2002;9:12-20. 24 Giannini S, Buda R, Cavallo M et al. Cartilage repair evolution in post-traumatic osteochondral lesions of the talus: from open field autologous chondrocyte to bone-marrow-derived cells transplantation. Injury. 2010;41(11):1196–1203. 25 Gigante A, Calcagno S, Cecconi S, Ramazzotti D, Manzotti S, Enea D. Use of collagen scaffold and autologous bone marrow concentrate as a one-step cartilage repair in the knee: histological results of second-look biopsies at 1 year follow-up. Int J Immunopathol Pharmacol. 2011;24(1 Suppl 2):69–72. 26 Gobbi A, Bathan L. Biological approaches for cartilage repair. J Knee Surg. 2009;22(1):36–44. 27 Hermann PC, Huber SL, Herrler T, et al. Concentration of bone marrow total nucleated cells by a point-of-care device provides a high yield and preserves their functional activity. Cell Transplant. 2008;16(10):1059–1069. 28 Hjortholm, N, Jaddini E, Halaburda K, Snarski_E. Strategies of pain reduction during the bone marrow biopsy. Ann Hematol. 2013;92(2):145-149. 29 Huang J, Zuk P, Jones N, et al. Chondrogenic potential of multipotential cells from human adipose tissue. Plast. Reconstr. Surg. 2004;113(2):585-594. 30 Hung SC, Chen NJ, Hsieh SL, Li H, Ma HL, Lo WH. Isolation and characterization of size-sieved stem cells from human bone marrow. Stem Cells. 2002;20:249-258. 31 Kapoor M, Martel-Pelletierm J, Lajeunesse D, Pelletier J, Fahmi H. Role of pro-inflammatory cytokines in the pathophysiology of osteoarthritis. Nature Reviews Rheumatology. 2011;7:33-42. 32 Kellgren JH, Lawrence JS. Radiological assessment of osteo-arthrosis. Ann Rheum Dis. 1957;1:49-502. 33 Kim J, Lee G, Jung G et al. Outcome of Autologous Bone Marrow Aspirates Concentrate Injection in Degenerative Arthritis of the Knee. Eur J Orthop Surg Traumatol. 2014;24(1):505–1511. 34 Kon E, Mandelbaum B, Buda R, et al. Platelet-rich plasma intra-articular injection versus hyaluronic acid viscosupplementation as treatments for cartilage pathology: From early degeneration to osteoarthritis. Arthroscopy. 2011;27:1490-1501. 35 Kurtz S1, Ong K, Lau E, Mowat F, Halpern M. Projections of primary and revision hip and knee arthroplasty in the United States. J Bone Joint Surg Am. 2007;(4):780-5. 36 Lawrence RC, Felson DT, Helmick CG, et al. Estimates of the prevalence of arthritis and other rheumatic conditions in the United States. Part II. Arthritis Rheum. 2008;58(1):26–35. 37 Li J, Wong WH, Chan S, et al. Factors Affecting Mesenchymal Stromal Cells Yield from Bone Marrow Aspiration. Chin J Cancer Res. 2011 Mar;23(1):43–48. 38 Lodi D, Iannitti T, Palmieri B. Stem cells in clinical practice: applications and warnings. J Exp Clin Cancer. 2011;30:9. 39 Murphy L, Helmick C. The impact of osteoarthritis in the United States: a population-health perspective. Am J Nurs. 2012;112(3 Suppl 1):S13-9. 40 Oliver K, Alexander RW. Combination of Autologous Adipose-Derived Tissue Stromal Vascular Fraction Plus High Density Platelet-Rich Plasma or Bone Marrow Concentrates in Achilles Tendon Tears. J of Prolotherapy. 2013;5:895-912. 41 Patel S, Dhillon S, Aggarwal S, Marwaha N, Jain A. Treatment with platelet-rich plasma is more effective than placebo for knee osteoarthritis: a prospective, double-blind, randomized trial. Am J Sports Med. 2013;41(2):356-64. 42 Pelletier JP, Caron JP, Evans C, et al. In vivo suppression of early experimental osteoarthritis by interleukin- I receptor antagonist using gene therapy. Arthritis Rheum. 1997;40:1012-9. 43 Roos EM1, Toksvig-Larsen S. Knee injury and Osteoarthritis Outcome Score (KOOS) – validation and comparison to the WOMAC in total knee replacement. Health Qual Life Outcomes. 2003;1:17. 44 Sampson S, Botto-van Bemden A, Aufiero D. Autologous Bone Marrow Concentrate: Review and application of a novel intra-articular orthobiologic for cartilage disease. Phys Sports Medicine. 2013;41(3):7-18. 45 Sánchez M, Fiz N, Azofra J, et al. A randomized clinical trial evaluating plasma rich in growth factors (PRGF-Endoret) versus hyaluronic acid in the short-term treatment of symptomatic knee osteoarthritis. Arthroscopy. 2012;28(8):1070-8. 46 Saw KY, Hussin P, Loke SC, et al. Articular cartilage regeneration with autologous marrow aspirate and hyaluronic acid: an experimental study in a goat model. Arthroscopy. 2009;25(12):1391–1400. 47 Sibbitt WL Jr, Kettwich LG, Band PA, et al. Does ultrasound guidance improve the outcomes of arthrocentesis and corticosteroid injection of the knee? Scand J Rheumato. 2012;41(1):66–72. 48 Spaková T, Rosocha J, Lacko M, Harvanová D, Gharaibeh A. Treatment of knee joint osteoarthritis with autologous platelet-rich plasma in comparison with hyaluronic acid. Am J Phys Med Rehabil. 2012;91(5):411-7. 49 Strem B, Hicok K, Zhu M et al. Multipotential differentiation of adipose tissue-derived stem cells. Keio J Med. 2005;54(3):132–141. 50 Talamo G, Liao J, Bayeri MG, Claxton DF, Zangari M. Oral administration of analgesia and anxiolysis for pain associated with bone marrow biopsy. Support Care Cancer. 2010;18(3):301-305. 51 US Department of Health and Human Services website. http://www.accessdata.fda.gov/scripts/cdrh/cfdocs/cfcfr/CFRSearch.cfm?CFRPart=1271&showFR=1. Accessed April 30, 2015. 52 Van den Berg W. Arguments for interleukin 1 as a target in chronic arthritis. Ann Rheum Dis. 2000;59 (Suppl 1):i81-4. 53 Van den Berg W. The role of cytokines and growth factors in cartilage destruction in osteoarthritis and rheumatoid arthritis. Zeitschrift für Rheumatologie. 1999;58(3):136-141. 54 Vinatier C, Bouffi C, Merceron C et al. Cartilage tissue engineering: towards a biomaterial-assisted mesenchymal stem cell therapy. Curr Stem Cell Res Ther. 2009;4(4):318–329. 55 Wehling P, Moser C, Frisbie D et al. Autologous conditioned serum in the treatment of orthopedic diseases: the orthokine therapy. BioDrugs. 2007;21(5):323-32. 56 Yang K, Raijmakers NJ, van Arkel ER, et al. Autologous interleukin-1 receptor antagonist improves function and symptoms in osteoarthritis when compared to placebo in a prospective randomized controlled trial. Osteoarthritis Cartilage. 2008;16:498-505. 57 Zhang Y, Jordan J. Epidemiology of Osteoarthritis. Clin Geriatr Med. 2010;26(3):355–36.